1 A dreidl is a small children's toy, like the one at the top right. It's basically a top with four sides. 2 Well, this is the Age of Geeks, er, Electronics, so I made this dreidl with the Rayshade ray tracer. Everything's polygons, including the letters. I quantized the RLE sequence into one colormap of 64 colors, not to reduce the resulting file size, but because Mach banding amuses me almost as much as this animation. I converted the file to an animated GIF with WhirlGif 2.0. Everything else ought to be obvious to those with a Rayshade manual. 3 Actually, this page is already pretty dry, isn't it? 4 The primary use of a dreidl, other than the obvious hours of amusement one can derive from spinning it, is a children's game in which the result of the spin either allows the player to claim some or all of the chocolate candies in the jackpot, or requires the player to add to the jackpot. That's right, teach 'em to gamble for food while they're young! A greeting card I made in 1995 or so. Basically tricks with Rayshade, notably reflective surfaces, shadows, and atmospheric effects. Details omitted; this really isn't profoundly complicated compared to the card below, which I wrote up first. Here's the card I made for Hanukah in December 1998. Geektails are below. More fun with Rayshade, mostly. I modeled the hanukiah (menorah) and candles with Emacs (of course) and rendered it with Rayshade. I used Rayshade's built-in textures and bump-mapping on the metal and candles respectively. I could have tried more bump mapping, but to really show partially melted candles with dripping wax I think would have taken geometric modeling, not just "Fun with Normals." The flames I stole from somewhere off the net and dropped in with Photoslop. 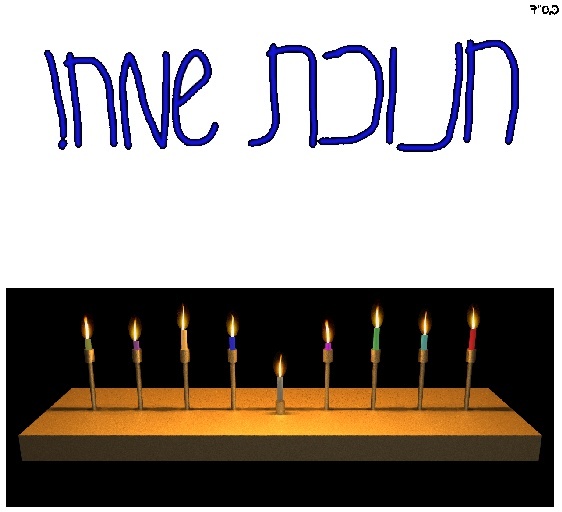 The words ("Hanukat Sameach," or "Happy Hanukah") I hand-drew in Photoslop, playing some tricks with the background/foreground colors to get the black border around blue text on a white background. The whole thing took about three hours, including rendering and re-rendering, and all the hand-tweaking. Note that the image here is a JPEG-compressed version, and thus looks significantly worse than the version I used for actually printing the cards. The cards were about 3.5 x 5 inches, and I printed the card (and thus the image) at 600dpi. But, for you, a higher-resolution image is here.